No water for Baptism in the Holy Sepulchre? Jesus may have walked on water and turned it into wine but the hefty water bill for one of the holiest sites of Christendom is proving a headache for the church. The Church of the Holy Sepulchre, said to be the site of Jesus’ crucifixion and burial, is struggling with a 9 million shekel ($2.3 million) unpaid bill owed to the Jerusalem water company. This week the Greek Orthodox Patriarchate of Jerusalem, which has extensive and valuable property holdings in the Holy Land and maintains a headquarters in the ancient church, had its bank account frozen, said an official at water company Hagihon. Forget what you read in the Bible. Forget what National Geographic has told you. Forget what your Sunday School teacher told you. Noah's Ark did not float around the world while it rained day and night and finally come to rest on Mount Ararat in modern Turkey. It sank and you can go visit it's rusting hull in Oyster Bay New York. 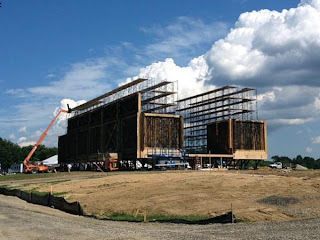 The NY Daily News is reporting that the set for the upcoming movie about Noah's Ark was severely damaged by Sandy the superstorm. It appears that God may have met his match. Noah’s Ark may have been sunk by a modern day storm of biblical proportions. 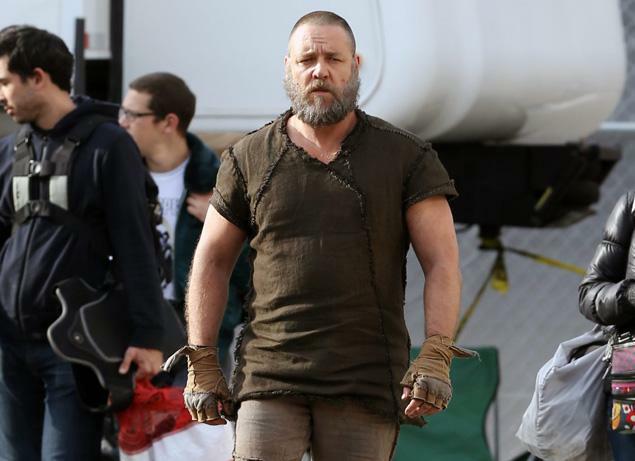 The replica of the Old Testament boat to be used in filming of Darren Aronofsky’s “Noah” may have been severely damaged at its Oyster Bay, Long Island, set by Hurricane Sandy, a source close to the production told the Hollywood Reporter. “There are so many fallen trees [blocking the roads], we can’t get any confirmation [of its condition] yet,” said the source. Production of the film, which was also shot in Brooklyn and Iceland, was abruptly halted two days before Sandy hit the area, as the cast and crew took to shelter. Russell Crowe, who’s staying in Manhattan during filming, took to Twitter to tell fans that he was hunkered down with a pot of Yorkshire tea. “Aah Tea, it's the ritual perfect for Hurricanes,” he tweeted. But Long Island didn’t fare so well. In the immediate aftermath of Sandy’s swathe of devastation, roughly 90% of households on the Island were without electricity. And Oyster Bay Town Supervisor John Venditto told Newsday that the storm had set a “new record” for fallen trees, which have downed power-lines and crippled travel. 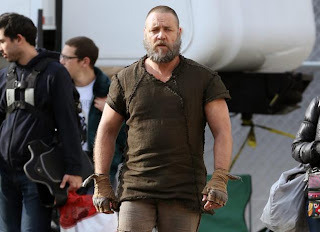 In “Noah,” which is set to sail into theaters on March 29, 2014, Crowe plays the titular hero, who is tasked by God to build an ark to save a male and female animal of every animal species before a torrential downpour washes away the rest of the life on the planet. Jennifer Connelly, Anthony Hopkins, Logan Lerman and Emma Watson round out the cast. I would have thought Crowe gave up doing seafaring films after Master and Commander. Today in my ongoing Thessalonians series I look at 1:9-10. For Paul and the Thessalonians the time of Jesus’ return was imminent. In 1 Corinthians 7:29 Paul says that “the time is short.” But for those of us living 21 centuries later the time has become “very long.” The return of Jesus has not happened and it is difficult to live with a feeling of imminence. It is hard to juggle the responsibilities of life and live with the belief that Jesus could return at any moment. Many of us probably think more about when and how we will die than when Jesus might return. While growing up I was exposed to teachers and preachers who often proclaimed that Jesus “could return at any minute.” This was presented as good news, but it was also confusing since for those of us in adolescence were also looking forward to growing up, marrying and starting families of our own. I remember one night at dinner my father suggesting that the Lord would probably return before my sister and I were through being teenagers. At that point my sister burst into tears and said “But I want to get married.” That cry of a young adolescent crystallizes the tension we can all feel while waiting for the imminent return of Jesus. We know that our hope should ultimately be focused on the day of Jesus’ final victory, but we also have a life to live in the mean time and need to invest ourselves in it. But perhaps we should not think so much along the lines of “imminence,” but “anticipation.” I suppose this is a low-key “imminence,” but it does recognize the tension we all feel of needing to live life with the belief that Jesus could return in any generation. We are waiting, and God is not on our time schedule. Waiting means that it is out of our hands. And waiting is how we recognize the sovereignty of God to have the final say. God works it in God’s time. There is a scene in C. S. Lewis’ The Voyage of the Dawn Treader that helps illustrate. Aslan, the Christ figure in the book, has just appeared to Lucy in the magician’s attic. But almost as soon as he has appeared, Aslan leaves with these words. “Do not look so sad. We shall meet soon again." "Please Aslan," said Lucy, "what do you call soon?" "I call all times soon," said Aslan; and instantly he was vanished away and Lucy was alone with the Magician. 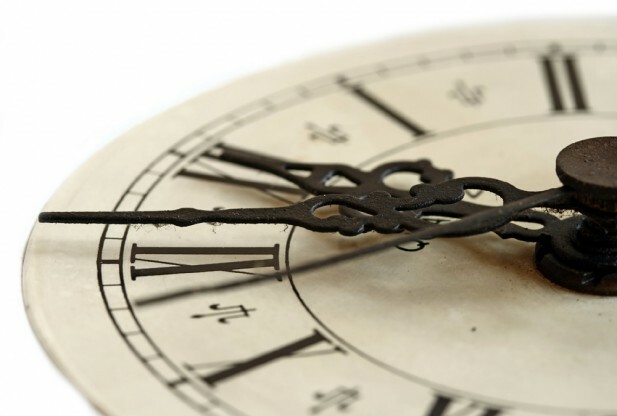 Lucy’s question reflects that desire to know at what point “when” will become “now.” But Lewis reminds us that when we are “waiting” time is not an issue, at least for God. Neither God nor Aslan is bound by time and for both all times and events are immediate and present. But for Lucy and the rest of us, we are left waiting and anticipating for that day and yet living our lives as if we will be here till we die. Living and waiting in anticipation also recognizes the church’s location within redemption history. We, as the church, are situated between the resurrection of Christ and the revealing of Christ. By its very existence the church is a witness to God’s redemptive work in history. And this is the church’s time for mission, to share the good news of what God has done in Christ. Although we are waiting for Jesus to rescue us from the coming wrath, we are also positioned to share God’s love with the world. As we will see later in this letter, evangelization is linked to the victory in the final arrival of Jesus Christ. Evangelization in the present time takes on eschatological significance. Jürgen Moltmann puts it this way in his Theology of Hope. The risen Christ calls, sends, justifies and sanctifies men, and in so doing gathers, calls and send them into his eschatological future for the world. The risen Lord is always the Lord expected by the Church – the Lord, moreover, expected by the Church for the world and not merely for itself. Hence the Christian community does not live from itself for itself, but from the sovereignty of the risen Lord and for the coming sovereignty of him who has conquered death and is bringing life, righteousness and the kingdom of God (p.325). Moltmann hits it on the head. The church of Jesus Christ, like Israel, is not saved for itself. It is saved to be part of the mission of God to the world. Therefore, we should ask ourselves how our lives should be different because of the hope we have that Jesus will one day return. It’s easy for the church to become insular and detached from the rest of the world as we wait for Jesus to return. But Christians are Christ’s representatives to the world. We have an obligation to not just live out the gospel in expectation of Jesus’ return; we also need to share it. The church cannot ignore the social ills and concerns of the world. This means not seeing the return of Jesus as an escape plan, but rather a close, but fuzzy timeline for the work of the gospel. True there is no clear end in sight. We don’t know at what point in time the “when” will finally become “now.” But as we wait for the return of Jesus we need to be Jesus to the world around us. Stop me if you have heard this one before. A man and his dog are walking in a park. The dog falls into a hole. When the man jumps in to rescue the dog he discovers that he is in an ancient wine press. Sorry, there is no punchline because it's not a joke. Although archaeologists prefer to excavate in "squares" using meticulous methodologies, sometimes things are discovered by complete accident. Arutz Sheva is reporting the following. Ancient wine presses have been found in Jerusalem – and will soon be part of a new park – thanks to a resident of Ramot who walked his dog several years ago. The dog fell into a hole and had to be rescued. It later turned out that there are more holes in the vicinity, and that a meaningful archaeological discovery had been made. Jerusalem Mayor Nir Barkat recently inaugurated the designated park, which is planned to become an open Biblical tourist park. The park, which will occupy 30,250 square meters, is located north of Jerusalem Park and northwest of Mitzpe Naftoakh nature park. Among the discoveries at the location are wine presses from the days of the First Temple, as well as pottery shards and two bronze coins from the Second Temple times. Massive digging at the location has been carried out by the authorities with the participation of local residents and school children. A full reconstruction of the wine presses is planned, under the supervision of renowned archaeologist Amichai Mazar. No animals were injured during the writing of this post. This picture has been going around Facebook. 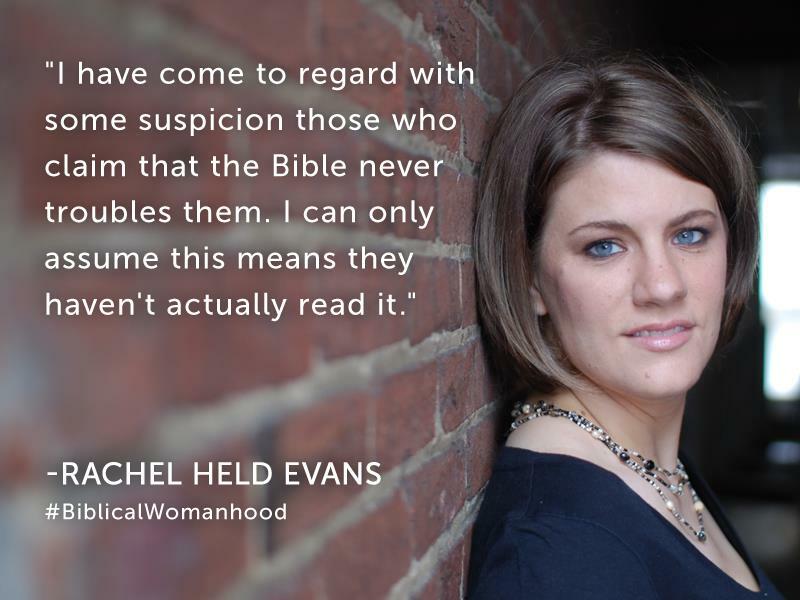 It is a quote from Rachel Held Evans' new book Biblical Womanhood. I haven't read the new book yet, but I am reading Monkey Town and finding that I really like the way she thinks. I have appreciated her blog and now her books. I think this quote is spot on. While many people read the Bible, I wonder how much of it they digest. What I means is, if you are not finding some parts not only spiritually challenging, but at times offensive then I wonder if you have really absorbed some parts. Don't get me wrong. I am not saying that there are not times that we should be "offended" by the Bible in such a way that it drives us to bring our life into balance before God and other human beings. But there are also some passages that are really hard to take because the world of the Bible is so different than our own. If those parts don't trouble you then I ask the same question Rachel asks: "Have you actually read the Bible?" If you have then you know the tension we experience of discovering the Bible to be what can only be described as the "words of life" as well as some "stuff" that just doesn't seem like it should fall under the definition of "divine inspiration." But that, I suppose, is part of the journey. HT: James McGrath via Facebook. 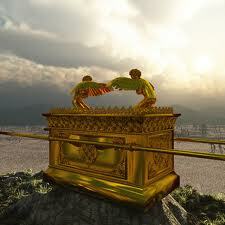 The Ark of the Covenant is one of those artifacts from history that will always attract attention. 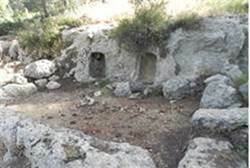 The famed Israelite box, known to us from the Hebrew Bible, is said to have been the footstool of God, was kept in the temple and contained the ten commandments, Aaron's rod that budded and some samples of manna. It is said that when carried into battle the Israelites were invincible, except for that time with Hophni and Phinehas. The Philistines captured the Ark and ended up with a case of hemorrhoids. At some point the Ark disappeared. Josephus tells us that by the time Herod built the Second Temple the Ark was nowhere to be found. But that hasn't stopped people from looking. Like the Holy Grail and the Kennedy assassination, people will be talking about it forever. Last year it was claimed it was found in the tomb of Alexander the Great. And from time to time Discovery Channel claims that the Ark was a small alien constructed nuclear reactor that made manna. Yet, no one has found the missing Ark. Recently 109.com ran a list of eight places where the Ark is said to be resting. The article also lists how these spots were chosen and why they are doubted. In an account written within the second book of Maccabees, an account of Jewish history during the Babylonian captivity written in Greek during the 2nd Century B.C.E., suggests the Ark narrowly survived the Babylonian siege. Among the Dead Sea Scrolls unearthed in the late 1940s, archaeologists found one scroll featuring writing along a thin piece of copper scroll.